Hey Lisa, yes the dining room is also Silver Fox! It's hard to tell, but our living and dining room are all one space. What a bummer on how your new gray photographs! That's something I never even considered, but is sort of a big deal when you're a blogger! Rats! Wonderful post and perfect timing for me. 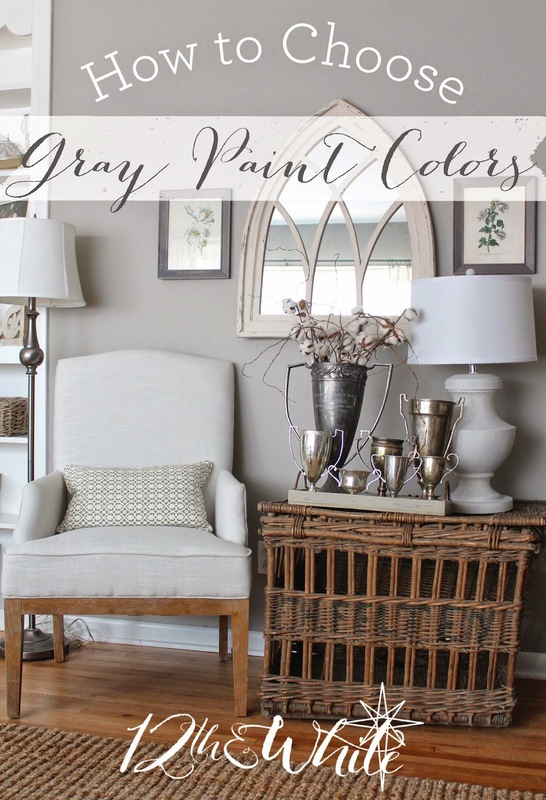 I am in the process of picking out paint colors right now and I know I want to go with a pale gray color. Thanks for all the great tips. Thanks Robin! Hope you find just the right shade!! Oh, and your papa's painting is lovely. How lucky you are to have a piece to cherish like that. Thank you for this. I have always been a taupe girl but I am currently reconsidering. I love every shade you've chosen! Thanks so much for sharing! That painting is absolutely gorgeous, as is the wall color behind it. I painted our bathroom revere pewter because of the popularity and HATED it. It read as lavender, which I thought was bizarre for a space with a ton of natural light. I immediately painted over it with another greige. My sister put it in a guest room and it's gorgeous. Go figure. I hated the revere pewter as well. painted my bathroom with it and it had a strong green undertone. My house, at least the main living area are all varying shades of gray. The color is so fresh to me. I adore it, I tried to do different colors and kept going back to gray. These are great options for that color. The Stonington Gray in my very light bathroom looks blue. Hi there, I would say the truest gray in our house is the Stonington Gray. Keep in mind, though, that each paint reads differently in different light and settings, so I'd try a swatch out first if you can! Hope that helps! Love your grey's, everyone of your rooms are amazing.... What about painting the block fireplace white with a cement floor stucco paint ....? I did mine in my last home and everyone who entered then went home and made that there next quick project. I think the wall grey and the white trim with the white book cases will elongate that wall making the fireplace disappear yet with perfect balance to that focal wall. See you soon and the beauty you inspire. I'd love to know where you got your two botanical prints on either side of the arched mirror. I've been looking for the perfect pair and those are perfect! I also love the frames. Any details?? Hi there, sorry to say they are antiques! Purchased in Savannah, GA. But my favorite trick for great botanicals is printing them from antique prints (vintageprintable.com is a great resources, there's also tons of links on Pinterest). Hope that helps! Could you please tell me where you got your wooden and metal coffee table? I cannot find one as nice as yours, and I love it!! I would greatly appreciate it!! Love your home! Thanks! Thanks! It's from Home Decorators! Check out the Paint Colors & Resources tab for all the details on our home! 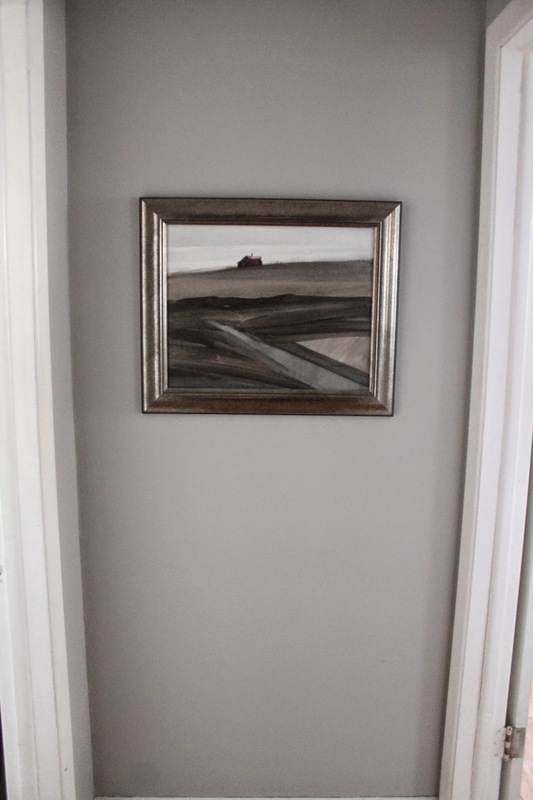 Hi - We have Boothbay Gray in our master bedroom as well. Trying to find a nice gray for our master bath (it is currently linen white like the majority of our house). Do you like Stonington with it? I had Silver Fox put in my foyer and it has blue or green undertones. I was hoping for the taupe-like that you mentioned. Do you think there is a problem with the paint? I'd like to do a an accent wall=A shade or two darker of then this color. Which color would you suggest? FYI; I am NOT AT ALL opposed to painting the ceiling a different/ lighter shade of that Boothbay gray color. Again, I just don't know which shade or color to go with. I not only welcome but I REALLY REALLY REALLY need some help, assistance, guidance, ideas &/or suggestions. Hey Natalie, thanks for reaching out! Sounds like you've got some big choices to make. Right now I'm not able to offer specific decorating advice, but there are quite a few other bloggers who offer this service. Rooms for Rent, House Seven blog, My Sweet Savannah are a few who come to mind. I bet they could help you pick the perfect shade if you sent them some photos and discussed the look you were going for. Hope that helps! Getting ready to paint a Master bedroom with dark furniture. What would be a great color of Gray to use? also Master bathroom? Not wanting blue tones. Hi Shari, the colors in our home without blue in them (at least in our specific light) are Stonington and Silver Fox. Hope that helps! Hi! Where did you get your Bible verse wall decor from? Hi Courtney, Thanks so much for your article and great recommendations. What is the best Gray to match up against Honey Oak Wood molding, Bead Board and Barn Doors of the same color? I just picked up samples of Gray Owl and Silver Gray (BM) today, and then read your advice on the samples :-) Thanks in advance! I've been *trying* to paint my living room and kitchen for over a year but have had bad luck finding THE perfect gray! Just the other day I realized I may have found it: Silver Fox! My living room faces north and a tiny bit of eastern exposure, so it's low light (not much natural light). I want to counter-balance the cool/blue light with a warmer gray, but NOT taupe! Would Silver Fox do the trick, without it making my already low-light room much darker? It's currently a sage green, a mid-tone green with a definite gray base. If I go too light it just looks drab and dirty, too dark and... well, you know! Also, I can't find the LRV of Silver Fox! Do you know what it is, Courtney? Hi! Your color choices are gorgeous! What white paint color did you choose for your trim? Thank you! Beautiful rooms! Thank you for sharing! We just bought a house and the dining room is light blue on the top half of the walls and dark blue on the bottom half. I'm painting them light gray on top and darker gray on bottom, but not too dark. What two grays from BM would look nice together? I'm drawn to Silver Fox and Revere Pewter but I'm not sure about the undertones going well together with whatever I choose.